Although a rather small region, Iwo Jima distinguishes itself in the history of warfare as one of the most heavily fortified regions ever known. It was targeted by the Americans due to its strategic location near the Japanese mainland. 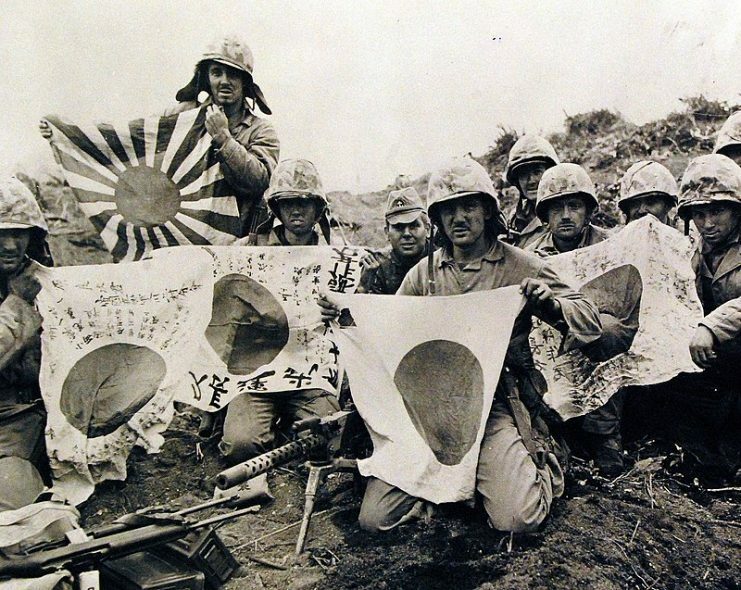 On one side was the United States Marine Corps, determined to serve their country by taking over the island, and on the other side of the battle was the Imperial Japanese Army (IJA), determined to fight until the last man, to stop the American invasion and protect their homeland. What ensued on the 19th February 1945, running for over five weeks, would be arguably the bloodiest battle of the Pacific Campaign. The island had three airfields and would be a staging area for the projected invasion of the Japanese home islands code-named: Operation Downfall. The Japanese were in poor defensive shape after having suffered severe losses against Allied forces in prior battles of the Pacific. Thus, the success of the invasion was already certain. 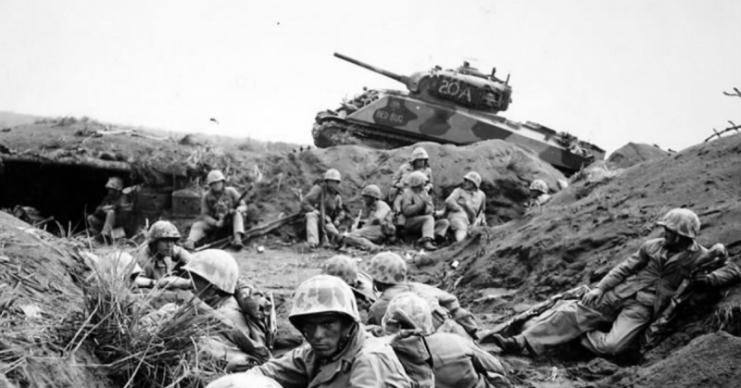 However, knowing that victory was a luxury they couldn’t afford, the Japanese forces in Iwo Jima, led by Lt. Gen. Tadamichi Kuribayashi were tasked with inflicting heavy casualties on the Americans in the hopes of making the Allies begin to doubt an invasion on Japan itself. Instead of the traditional Japanese system of direct engagement along the beach, Kuribayashi pulled his forces deeper into the Island. He employed a dense network of bunkers and pillboxes, hiding hundreds of landmines, mortars, and artillery all over the island. 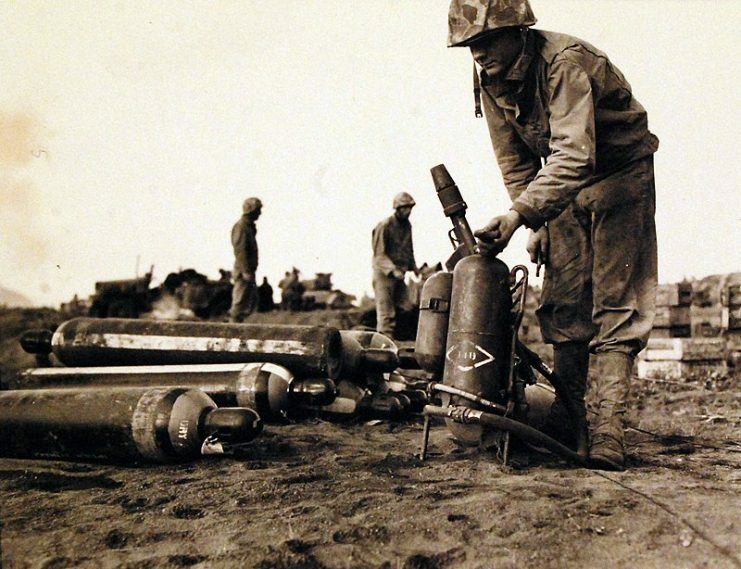 Every high and low place of Iwo Jima was surveyed to be completely submerged in Japanese defensive fire. Furthermore, a handful of Kamikaze pilots were kept on standby. 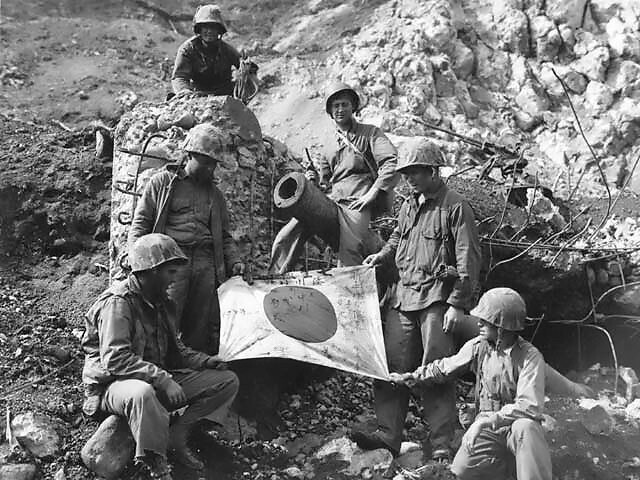 Iwo Jima would become distinguished an incredibly tough nut to crack for the Allied forces. 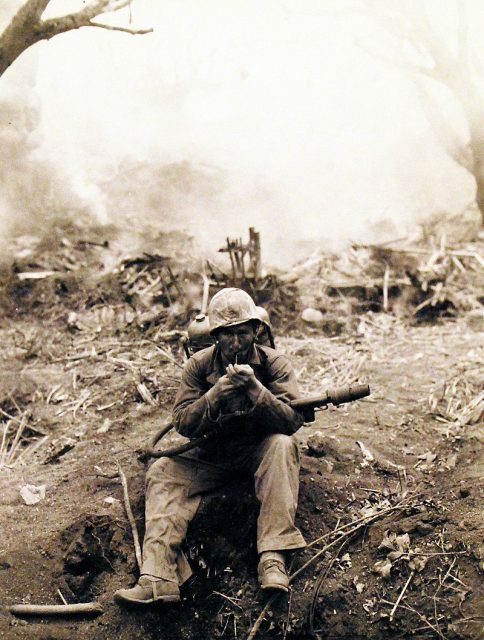 A U.S. Marine firing his Browning M1917 machine gun at the Japanese. Naval bombardments and air raids against Iwo Jima commenced on the 15th of June, 1944 ahead of the D-Day which was the 19th of June. Just two days into the constant bombardment, America’s USS Blessman ship lost about 41 personnel including 16 members of her Underwater Demolition Team (UDT) due to shelling from the Japanese. Also during the pre-landing bombardments, the USS Pensacola was hit by a Japanese battery causing 17 deaths. The USS Leutze was also hit and suffered 7 deaths while aiding 12 vessels in a failed attempt to go ashore. 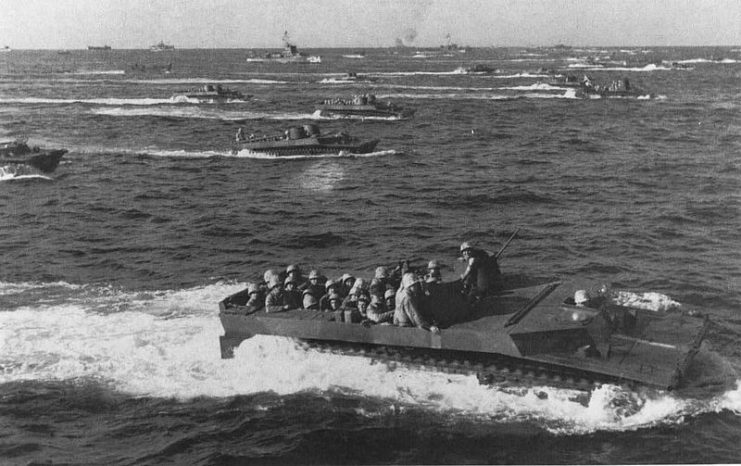 However, an amphibious landing was successfully carried out by the U.S Marines on the D-Day. About 110,000 men comprising the U.S. Marine, Navy corpsmen, Soldiers, Air Force personnel, etc. were deployed for this operation alongside over 500 ships. On reaching the beach, the absence of hostile engagement made them believe that most of the Japanese were killed during the pre-landing bombardments. Unknown to them, they were surrounded by the Japanese who knew the Island well. 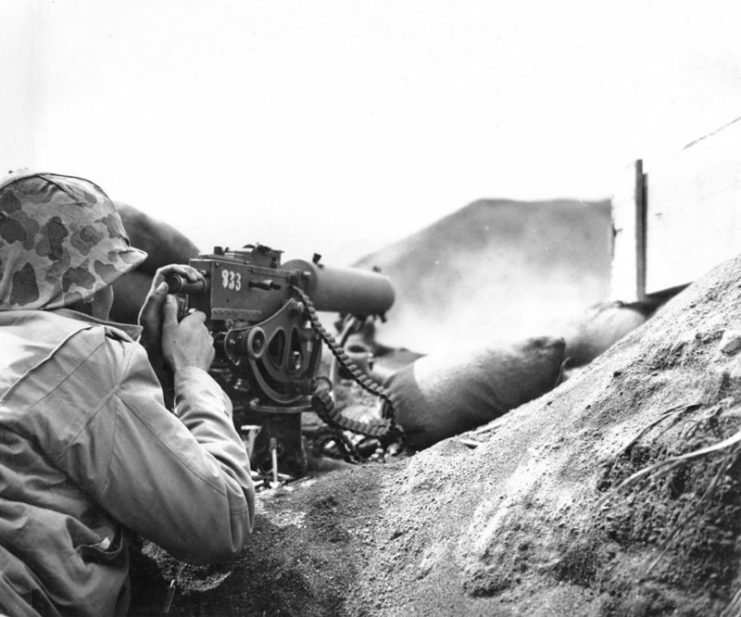 After allowing the Marines to move deeper inland with their machinery, Kuribayashi’s machineguns and mortars struck from Mount Suribachi. 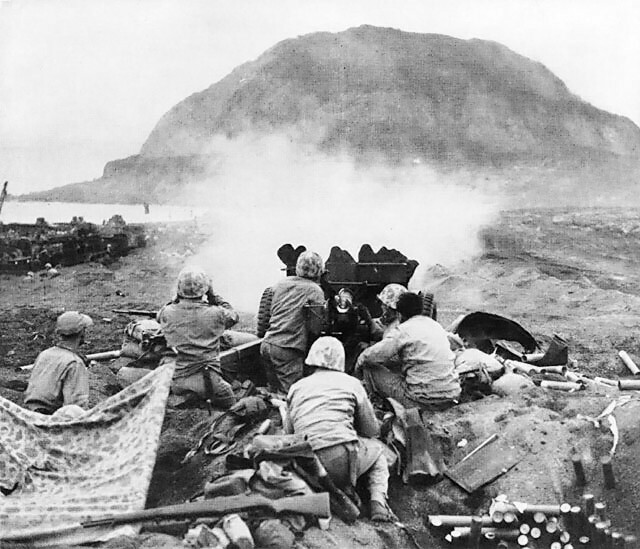 Four days into the battle, Mount Suribachi was captured by the Marines. They hoisted the American flag on its summit, it was the first American flag to be mounted on Japanese lands. One after the other, the airstrips were captured. 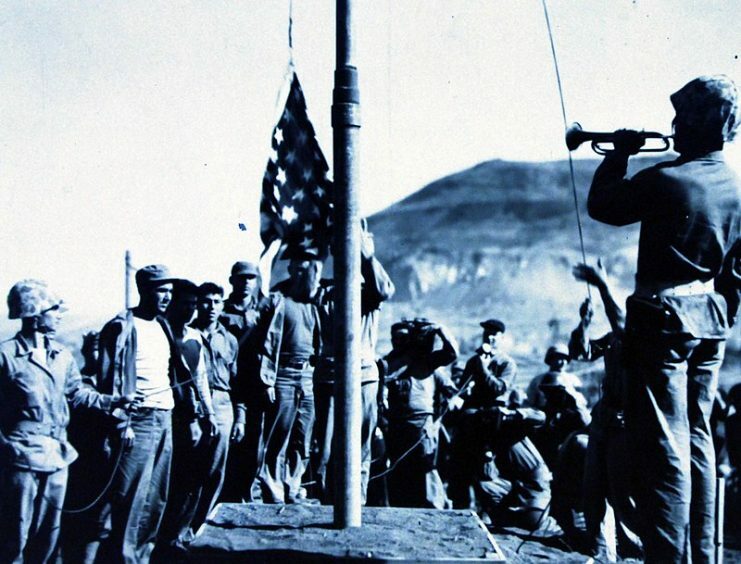 Victors – In the stiff breeze atop Mount Suribachi, Iwo Jima, “Old Glory” whips against the sky as cheering Marines raise their voices and weapons in the historic moment for posterity. The Japanese were eventually overwhelmed by the Americans. However, they inflicted heavy casualties with about 6,800 deaths on the American side. 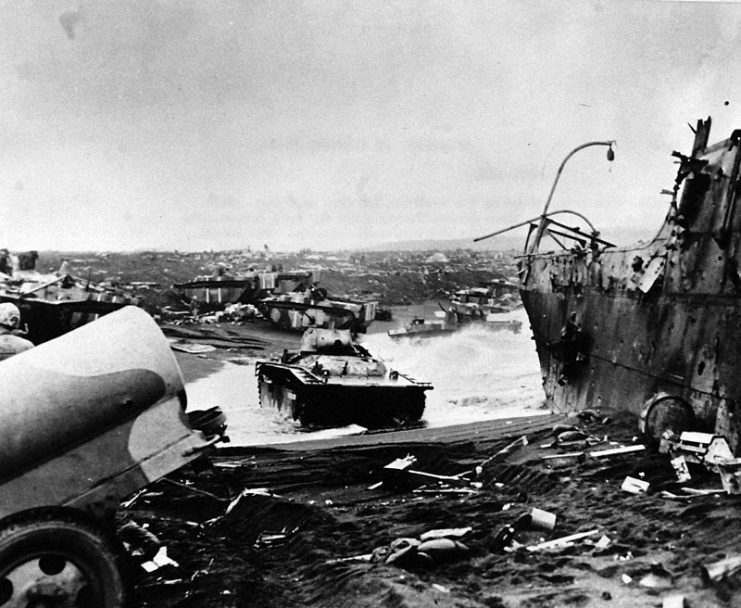 The Japanese suffered devastating losses while ultimately losing the island. 21,000 deaths were recorded on their side, with about 216 taken prisoners. The aftermath of the invasion drew concerns from several corners. 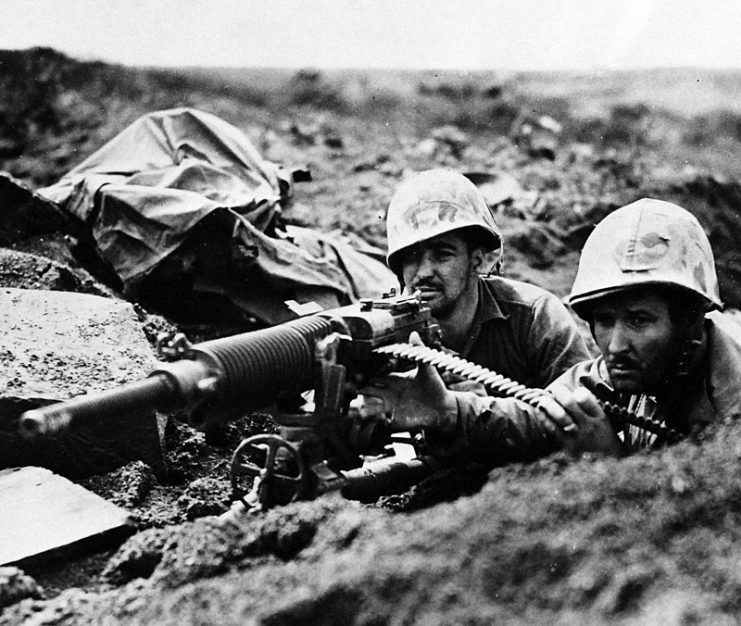 The Battle of Iwo Jima was the only battle that had more American casualties than Japanese. It was a victory which some believed was not justified by the weight of the price. 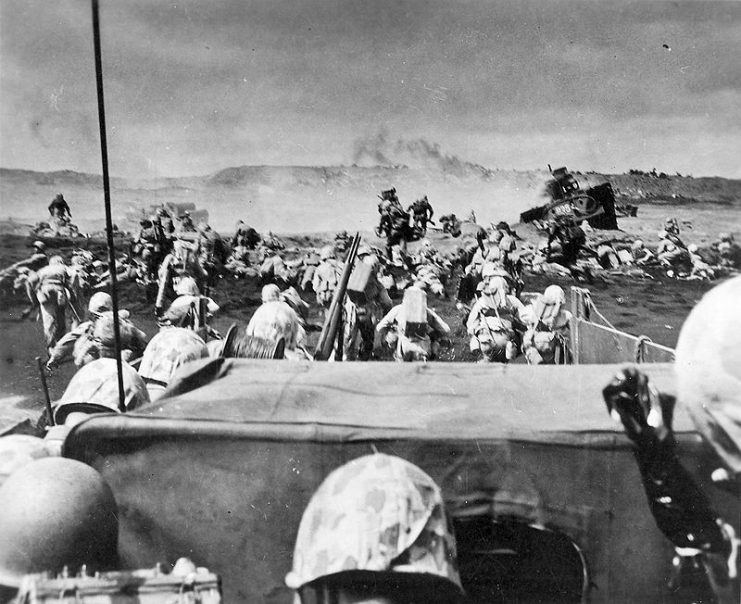 Moreover, the island of Iwo Jima was never used as a staging area, as originally intended. However, the airfields were reconstructed for emergency landings by the Navy Seabees. 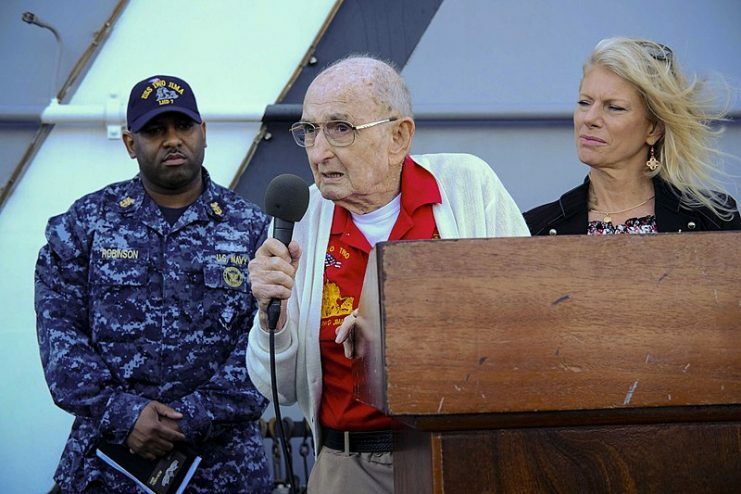 About twenty-seven medals of honor were awarded to Marines who took part in the operation. 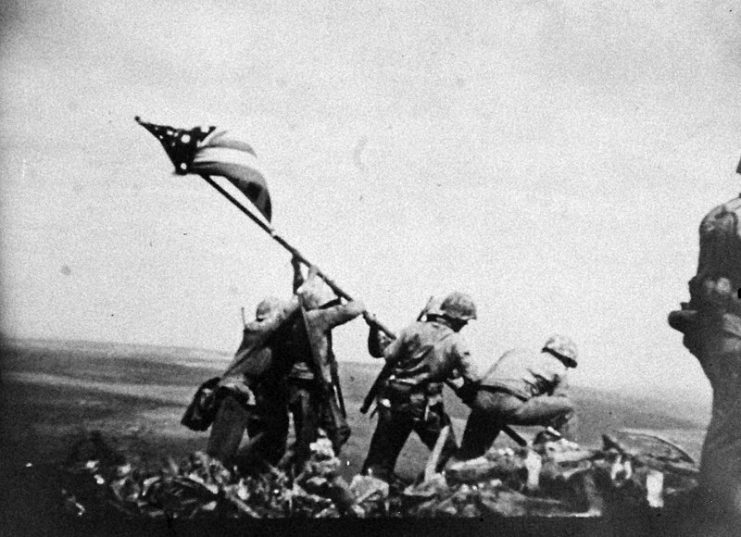 Contemporary footage from Iwo Jima can be seen in the following video clip. 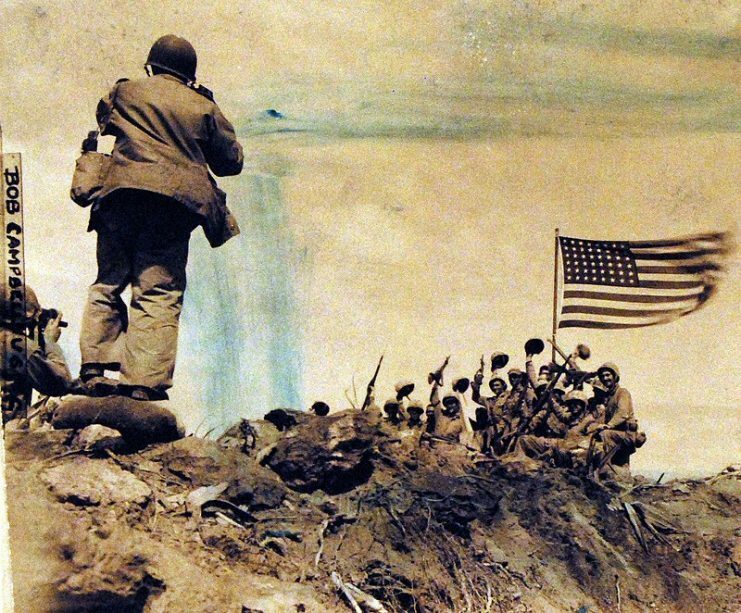 A “still” taken from the 16mm movie series of the U.S. Marines raising the American flag on the summit of Mount Suribachi, Iwo Jima. 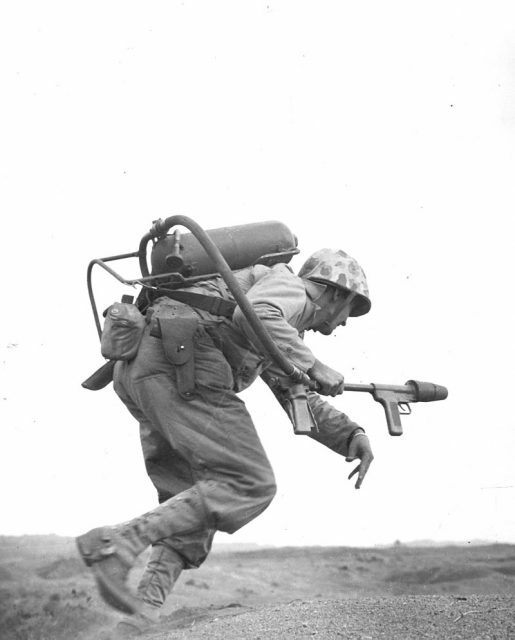 Between two airfields (Motoyama), Private First Class Thomas N. Brown, is refueling a flame thrower. 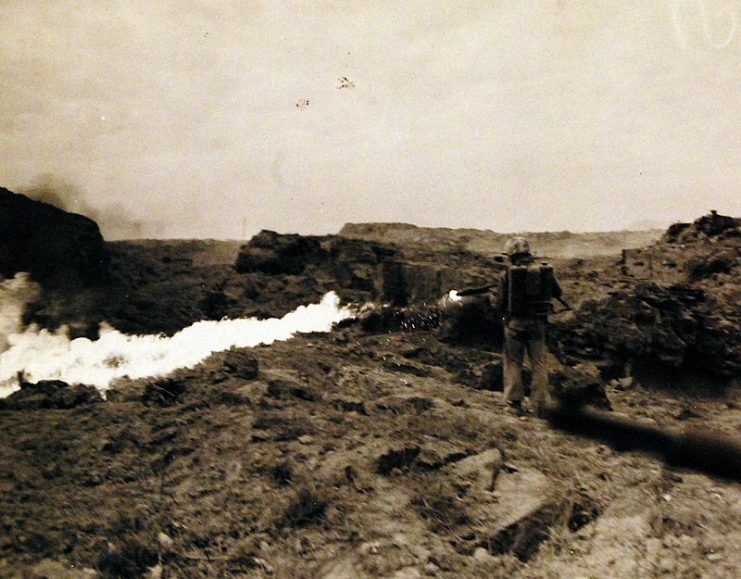 Sergeant Leonard J. Shoemaker, Newberry, Michigan, uses his flame thrower on Japanese caves in mopping up operation on Iwo Jima. Secretary of the Navy James V. Forrestal, left, and Fleet Admiral C.W. 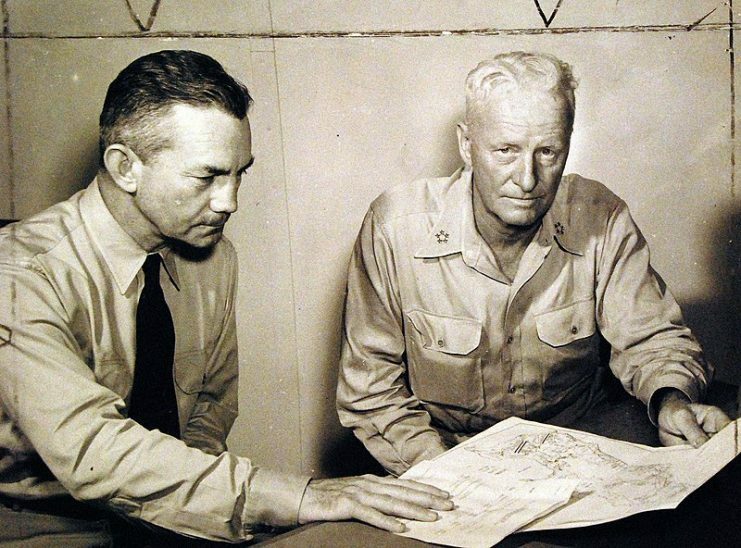 Nimitz, USN, Commander in Chief, U.S. Pacific Fleet and Pacific Ocean Areas look over final plans for the invasion of Iwo Jima. 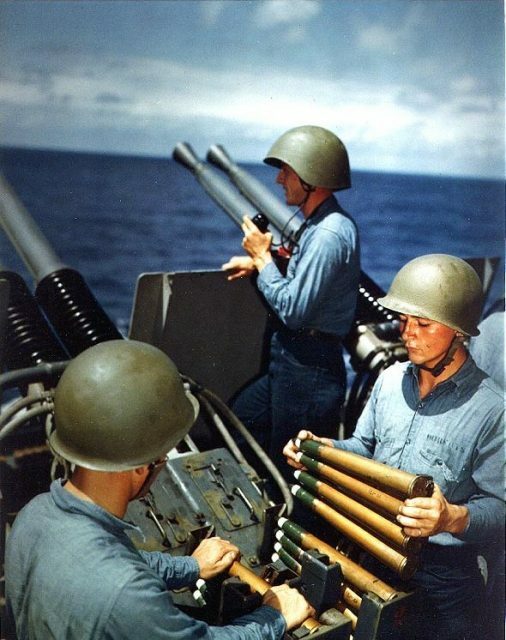 USS Alaska (CB-1): Crew of a 40mm quad antiaircraft machine gun mount loading clips into the loaders of the left pair of guns. 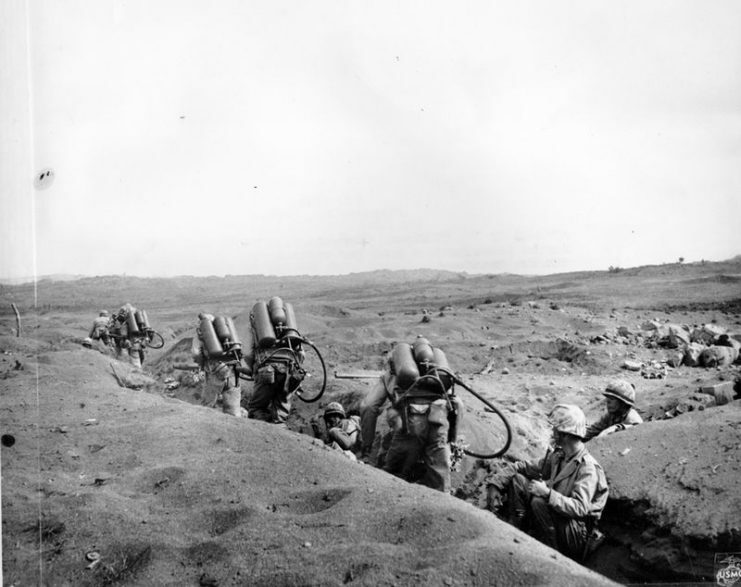 Taken on 6 March 1945, during the Iwo Jima operation. Iwo Jima February 1945. 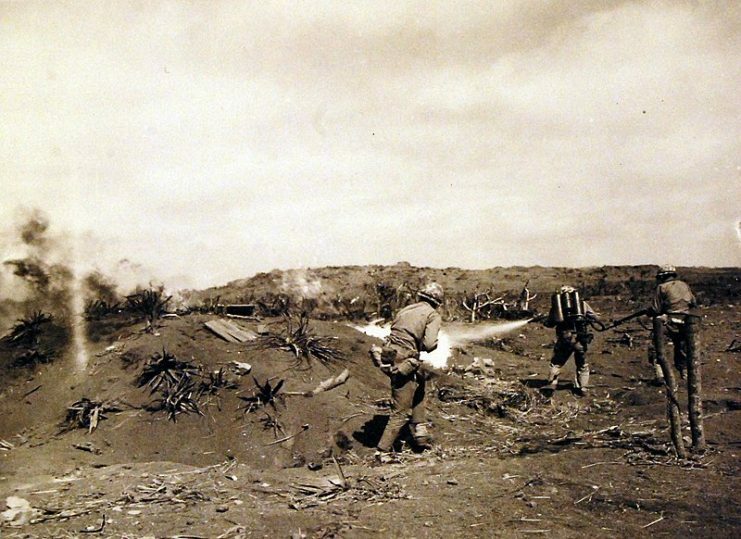 Riflemen lead the way as flame throwing Marines of the Fifth Division, crouched with the weight of their weapons, move up to work on a concentration of Japanese pillboxes. 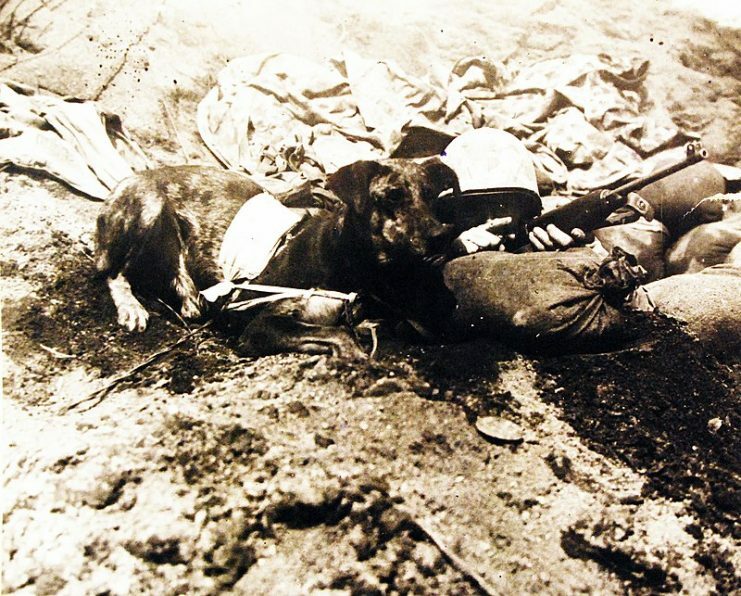 Crouching in a foxhole they share in Iwo Jima are Marine Corporal Virgil S. Burgess and his courier dog, Prince. 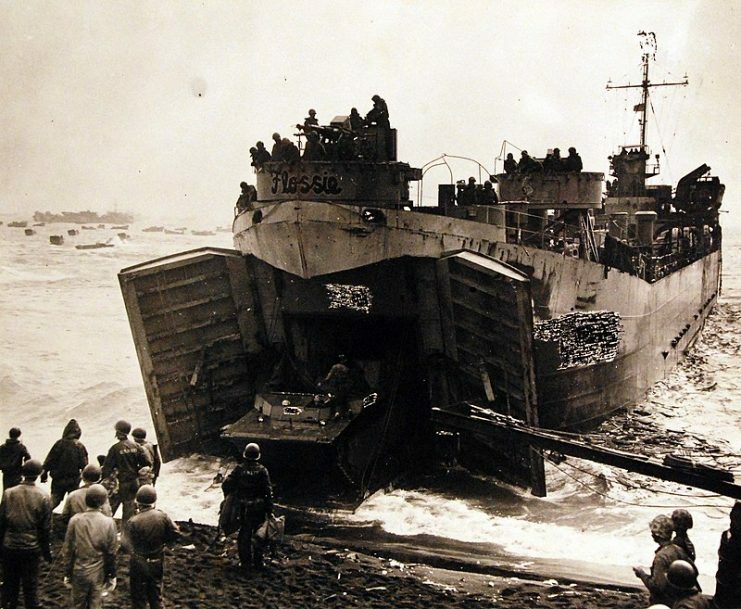 Flat-nose Flossie” LST at beach while elements of a Marine Corps amphibious tractor unit unload her cargo under protection of her forward guns, February 19, 1945. 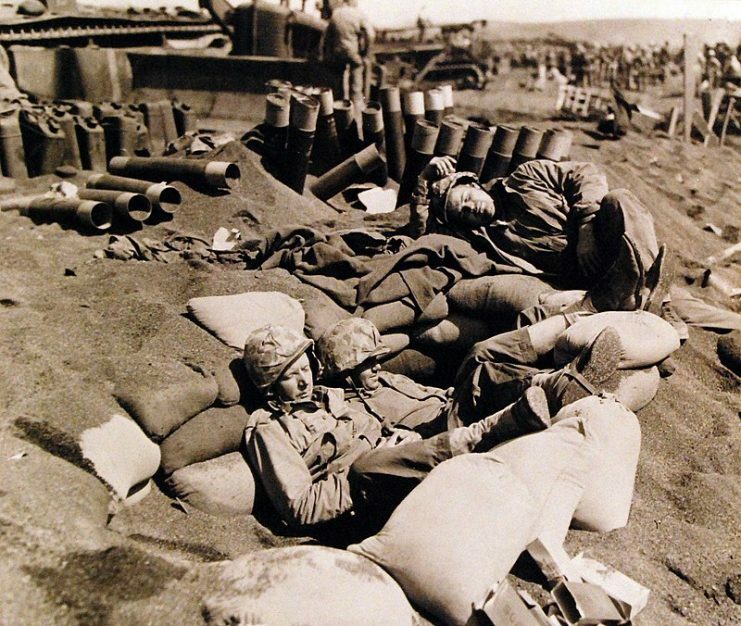 Sprawled in the grey volcanic ash on the beach of Iwo Jima two U.S. Navy Seabees and a Marine seek solace in a quick nap. 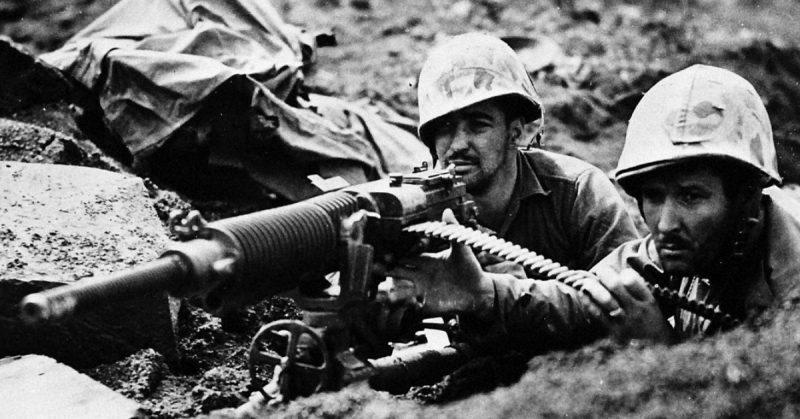 After their own gun was knocked out on Iwo Jima, Marines of the Fifth Division took over this captured Hotchkiss machine gun and gave the enemy back some of its down lead. 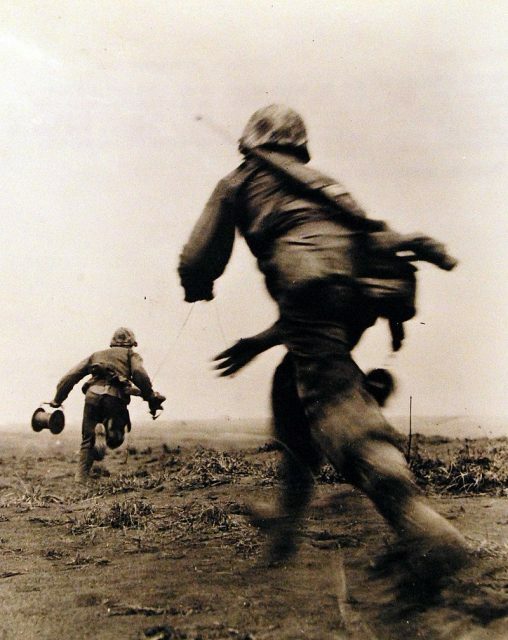 On Iwo Jima, two Marine wiremen of the Fifth Division race across an open field, under fire, to establish field telephone contact with the front lines. 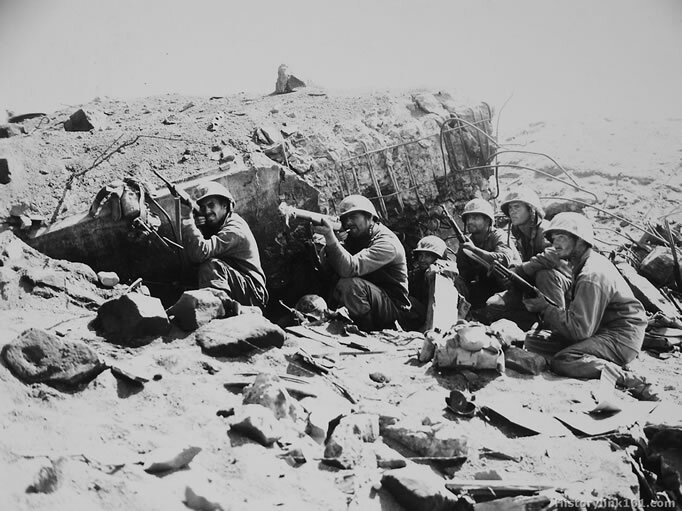 Fifth Division Marines grouped behind their light machine gun, display Japanese battle flags captured during the first few days of the bloody fight for Iwo Jima. 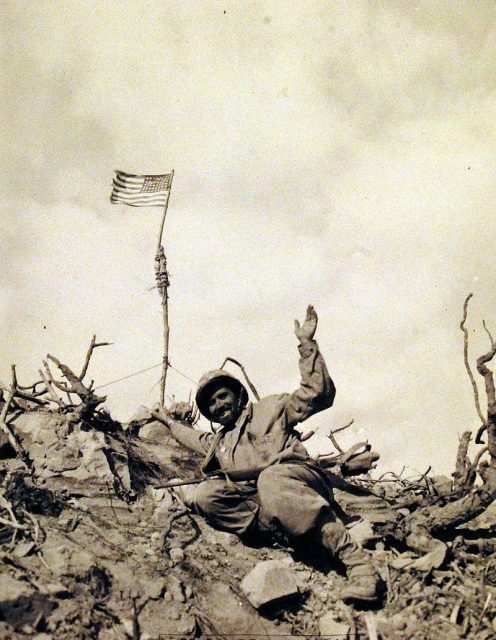 It was the men of the Fifth Division who fought their way to the top of Mount Suribachi to raise the American flag on the rim of the crater.